Takano Kyohei, Oda Takenaga, Toyama Yukinojo, and Morii Ranmaru are going to rent a house to go to school for free on the condition that they make the girl of the house a "lady." However, Nakahara Sunako, the girl living there, is gloomy, weird, and horror movie maniac. She has a trauma of when she was told she was ugly by the boy whom she loved when she was in junior high school. She doesn't like beautiful things and gets a nosebleed when she looks at something beautiful. I must say, even for a shoujo title, this story has a lot of originality as well as taking advantage of the same old clich&eacute;s but with a twist. With Nabeshin as director, I couldn't expect any less, as he makes every episode hilarious! And it's nice to see the series has its serious and dramatic moments, and when you see them, you'll crave for more, seriously. Sunako-chan is quite a character, and you'll love her from the getgo. She is a very special girl, and she suffered quite a lot from a mid-school drama. Be sure to pay attention to the series as this is revealed in the first episode and repeated a couple of times more, and it's the reason she locks herself to the world and considers everyone else a &quot;dazzling creature&quot;, even though she's really beautiful behind that odd and scary exterior. She doesn't have any confidence, and she constantly is having nosebleeds upon seeing beautiful people, so living in a house with 4 bishounen is not easy for her! Deep inside, she is very careful and fond of the people around her. Kyouhei is a very rude boy and food is what drives his mind, and you'll find him very obnoxious, until you begin to see his true self, and he doesn't show it clear, so you'll have to keep an eye to find out! He'll begin to care for Sunako-chan as he sees her true self. This is a comedy series, but it has its romantic touchs here and there, and of course some drama, but remember that comedy is what drives this series! So it's not your conventional shoujo. Most likely a low budget was responsible of this: the animation was fair and dit the job, but could've been a lot better. The first opening video was made of recycled scenes from the first episode, and until eps. 14 we see a new opening video with original animation. 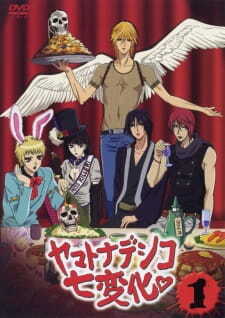 The series over emphasizes the use of chibi-formed characters, specially with Sunako. Even though chibi = funny and it's always appreciated, I think they overdid it with Sunako-chan, as we get to see her true form a limited amount of times. The soundtrack was decent, and played along the theme of the series. The opening song was good, the first ending was passable, but the second ending theme (by BON-BON BLANCO) was very good. The seiyuus for the series were excellent and they did a wonderful job with their roles. A 10 withouth a doubt, you'll laugh a lot, and even shed a few tears from time to time! Yamato Nadeshiko Shichi Henge was a pleasant adventure from the start, and it's loaded with entertainment and fun, with hints of romance and even some drama. And if you happen to be a fan of Nabeshin (Shinichi Watanabe) then you're in for a treat. I'd like to see a second season of the series, though, as the story continues. With the manga still running, it's a possibility we'll get to see more of Sunako-chan and the boys sometime! Ater taking nearly 4 months to complete, this show finally got the last episode subtitled. So, what were my thoughts? The story started off great. Four guys need money to pay rent, so their landlord asks them to "turn this crazy girl into an actual lady". Eh, not an amazing story, but sounds funny. I'd probably have given it more than a 6 if it actually went anywhere. But, it didn't really progress, nor did we get to see much happen from the start until the end. Prepare to be swamped by constant chibi characters. Odd models and bland scenes..the art is something to be desired. Nothing special. The opening and ending didn't stand out to me, nor did any background music. Could have been a lot better. The saving grace for this show. Without the male lead and the female lead, this anime would have sucked. I enjoyed learning a little bit about each character's past. I wouldn't say any character really evolves though, as they're pretty much static throughout. I guess the female lead changes a bit (doesn't she have to?). Funny, happy, I had a good time watching this. There are tons of "worthless" episodes that don't progress the flow of the story at all, but whatever. If you're looking for a brainless anime that will make you chuckle every so often, check this out. There's better out there though. I thought that the story was actually quite original. At first I thought that it would be your usual story. They try to change her and then they fall in love and then love rivals appear and some comedy is thrown in but that didn't happen in the slightest, which I thought was quite refreshing. I do wish that focused a little bit more on the relationships with each other, especially Sunako (Main Character). Some people may not like the artwork but I thought that it went quite well with all of the characters personalities and I also really liked the way that they changed their style of artwork depending what was happening (or going to happen), and it makes it alot more funny and entertaining. The sound was good, in the beginning I didn't like the opening song but it grew on me during the series and it fitted to the anime perfectly. I didn't like the first ending song but I liked the second song because it was a contrast to the opening. I liked the characters because usually when you have bishounen and bishoujo in an anime they usually are totally oblivious to it or they use it to their advantage. None of that happened here (except for one character). I must say some characters were a bit annoying and you may want to slap some of them. This anime is partly interesting because it shows that all of them are actually suffering from being so good looking, which is very different. It shows a different point of view of being a good looking person. I thought that it was really funny and that was a surprise to me because I thought it would not be a very normal emotional story but it was nothing like that. I thoroughly enjoyed each episode because something outrageous alwayse happened in each one. Overall I give it a 7/10 because it was really entertaining and a good watch although I wished a bit more happened between the characters and I was personally disappointed with the ending episode. I hope there is a second season! Watching Yamato is like dating a someone (guy or girl) who looks like Borat in a mini-skirt. Prolonged exposure could leave you with a desire to gouge your eyes out, though on the plus side, you'll enjoy Yamato's hidden charm a lot more once yours eyes are bloody pulps on the floor. Normally, art is a minor detail for me, but the atrocious art in Yamato cannot be ignored. While there is a lot to blame, the bland backgrounds, the sub-par animation, the dreary colors, and the overly constant use of chibi characters, one particular feature completely stands out. The four main male leads are suppose to be some of the hottest men on the planet, and yet half of them make Golum look like a stunner. While I understand the typical trend of attending feminine characteristics to male leads in shoujo shows, and many shows like Host Club does it well, Yamato has taken the trend to its utterly grotesque extreme. Toyama and Ranmaru come across as grotesque drag-queens who've spent the last 48 hours covering their eyes with dark eye-liner.It is hard to imagine how anyone could find such characters attractive. Every girl who showed Toyama to so far has shook her head in disdain, and every guy had a pulsing sensation hurl my notebook off the 5th floor balcony. This is a real pity, given that animation aside, Yamato has potential. While there was little plot development, each character has some depth, and there are some scenes that can draw genuine laughs. The story itself also holds unique premise, telling the tale of a girl who dresses and behaves hideously, and four guys who try to make her realize her own hidden beauty and become a lady. It's just too bad that you don't tend to laugh very much when you feel like someone's sticking hot pokers in your eyes. In the end, Yamato is an above average shoujo comedy, save for its abysmal visual design. Perhaps the creators were trying to make a deep metaphor between the anime and the main female lead. Alas, they would probably be better off redoing the anime in Flash with each male character replaced by a color coded stick figure. At least that way the comedy would come through, without the visual torture. There is no such thing as too much love, most especially when it comes from a bunch of cute guys with unique and charming personalities. Here are some of the most exciting reverse harem anime of all time, sure to make you giggle, blush, and crave for more!